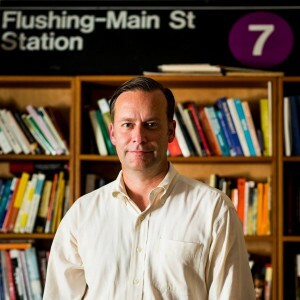 R. Scott Hanson, Ph.D. (University of Chicago), has spent most of his adult life thinking about diversity and pluralism in America and the world, but much of it has focused on the neighborhood of Flushing, Queens in New York City. He received his B.A. in 1992 from the Plan II Liberal Arts Honors Program at the University of Texas at Austin, where he doubled majored in English Honors and concentrated in American literature, critical theory and creative writing. He then moved to New York City to begin an M.A. in Religion at Columbia University, where he started to focus on the intersection of American religious history and immigration. He began work as a researcher in New York City for Diana Eck’s Pluralism Project at Harvard University in 1994 after completing his M.A. He did much of the fieldwork in New York for the multimedia CD-ROM On Common Ground: World Religions in America, covering the Hindu, Sikh, Jain, Tibetan, Sri Lankan, Thai Buddhist, and some Muslim communities. His research in Queens ultimately led to a focus on the history and extreme case of religious pluralism in modern Flushing that he explored more fully as a doctoral student in the Committee on the History of Culture at the University of Chicago. His first book, City of Gods, was published in July 2016 by Fordham University Press and their Empire State Editions imprint. After receiving his Ph.D. from Chicago, Dr. Hanson worked as a postdoctoral research associate at Brown University, and he has taught at Philadelphia University, Binghamton University-SUNY, Delaware Valley College, Temple University, and the University of Pennsylvania. He is currently a Lecturer in History and Director of the Social Justice Research Academy at the University of Pennsylvania. He has been interviewed in newspapers and on radio, given many public lectures, worked with museums, and he also plans to resume work on a documentary film version of the book. He lives in Philadelphia with two wonderful sons and a dog.